These Kid Mannequins are Made of Durable Plastic and have Realistic Physical Traits! The Life-Like Dress Forms are Some of the Best Store Fixtures Available! Buy Kid Mannequins that are Dual-Purpose to Display Various Garments in a Retail Setting! 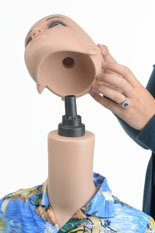 What is the advantage of purchasing a kid mannequin from this online store fixture supplier? Great question! Buying kid mannequins at StoreFixture.com has many benefits. For one thing, the dress forms are often sold in unisex designs. As a result, the kid mannequins provide flexibility when creating exciting storefront presentations with both girls' and boys' clothing. Many of the youth figures have realistic features, which are exceptionally appealing to little customers and their parents. These kid mannequins, also called life-size child models, are crafted from high quality materials. Polyethylene plastic is used for many of the bodies because it does not chip, scratch, or fade. The kid mannequins also come equipped with stable bases that are typically fabricated using tempered glass or metal for lasting durability. Yet another reason to purchase from this E-catalog is that the mannequins are packaged as a set of two in many cases. Pay just a single low price for double the merchandising capability! Store fixtures, like these children's apparel forms, are the perfect tools for developing an alluring window display at any clothes shop. Painted facial characteristics add a level of realism that is very helpful when communicating to young customers. Demonstrating how certain articles and accessories will look when worn is crucial in getting shoppers to try on selections. Most of the figures have bald heads that can be dressed up with a wig or hat. This way, there are all sorts of display possibilities. Entire scenes and atmospheres can be set up to feature a seasonal fashion line or a specific style of clothing. The male and female configurations are made to represent a couple different ages as well. One design covers four to five year olds, while another ranges from six to seven. The assortment provides even more versatility for different kinds of showcases. What types of accessory items can be featured on the dress forms? Because each model includes an innovative calf rod base, footwear is easily added. Many options from competitors do not accommodate shoes. Putting some athletic sneakers or dressy wingtips can really change the overall look of the display. Hair accessories and jewelry are commonly featured when the figure is displayed with a female wig. Headbands, ponytail ties, necklaces, and bracelets are subtle augmentations that definitely draw in consumers. Sports hats, especially those from local teams, are often placed on the male forms for extra appeal. Some kids are such big fans that the simple change can be a real game changer when it comes to sales. Unconsciously, the shopper identifies with the featured team and will be more likely to want the displayed apparel. Backpacks are made for necessity, but children will tell you that style is extremely important during the school. Fall sales and back-to-school specials are the perfect time to add on a bag. Get creative! While there are many different accessorizing techniques listed here, retail managers and store clerks are always coming up with new ideas about how to boost profits. While some models are made with abstract designs, these units emphasis realism. Each features a sun-tanned skin tone color rather than duller whites, blacks, or grays. This type of design is perfect for virtually every color of apparel simply because it will not create a washed out appearance with lighter clothing. The realistic skin gives users the versatility they need when featuring different colored articles and outfits. What are some of the most effective locations to implement the clothing dummies? As briefly mentioned above, window displays and storefront presentations are definitely some of the most common places to use the store fixtures. The high prominence of front windows allows the mannequins to instantly grab customer attention. It also gives the store manager the opportunity to draw in more potential clients that might otherwise pass by without giving the establishment a second thought. The sales floor is another effective merchandising location for the child body forms. Regular garment racks are frequently supplemented with a mannequin, so shoppers can get a better idea of the available clothing options. Due to the small size of the youth displays, they will fit on tabletops. Many department stores utilized tables to showcase folded clothes alongside a torso form. The child sized display fixtures can exhibit a full outfit rather than just a top or blouse. Placing them up high helps consumers navigate to different departments with little effort. StoreFixture.com is home to one of the broadest, most in-depth collections of display tools. These male and female mannequins are only some of the full range offered. There are also headless, abstract, half body, and dress form styles as well. Of course the complete selection of store fixtures ranges far beyond just clothing racks and displays. There are dump bins, retail tables, gridwall & slatwall accessories, literature racks, signage solutions, cable systems, acrylic & plastic business card holders, carts, shelving, display cases, and building/facility supplies. Just about any equipment required for retail sales is available in the vast merchandising displays E-warehouse. Tons of display racks are available. Although our online presence is strong, we have a full staff of talented individuals that are here to help. The customer service call center is open from 8 a.m. to 6:30 p.m., Monday through Thursday, and 8 a.m. to 5:30 p.m. EST on Fridays. Simply dial 1-800-572-2194 to speak directly with a representative. While on the website, shoppers can access a live chat feature that opens an instant messaging session. This feature has grown very popular with many of our clients. If you are unable to get in touch during business hours, then send an Email message. One of our team members will contact you with the information requested as soon as the next business day. Shop the in-stock selections and place your order before 1 p.m. to qualify for same-day shipment!